By using swarms of untethered grippers, each as small as a speck of dust, Johns Hopkins engineers and physicians say they have devised a new way to perform biopsies that could provide a more effective way to access narrow conduits in the body as well as find early signs of cancer or other diseases. In two recent peer-reviewed journal articles, the team reported successful animal testing of the tiny tools, which require no batteries, wires or tethers as they seize internal tissue samples. 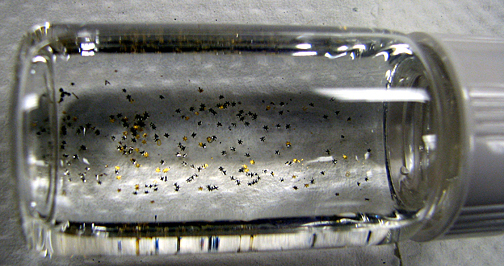 The devices are called “mu-grippers,” incorporating the Greek letter that represents the term for “micro.” Instead of relying on electric or pneumatic power, these star-shaped tools are autonomously activated by the body’s heat, which causes their tiny “fingers” to close on clusters of cells. Because the tools also contain a magnetic material, they can be retrieved through an existing body opening via a magnetic catheter. This image depicts an mu-gripper near the opening of an endoscopic catheter. Image credit: Evin Gultepe, Gracias Lab, Johns Hopkins University. In the April print edition of Gastroenterology, the researchers described their use of the mu-grippers to collect cells from the colon and esophagus of a pig, which was selected because its intestinal tract is similar to that of humans. Earlier this year, the team members reported in the journal Advanced Materials that they had successfully inserted the mu-grippers through the mouth and stomach of a live animal and released them in a hard-to-access place, the bile duct, from which they obtained tissue samples. 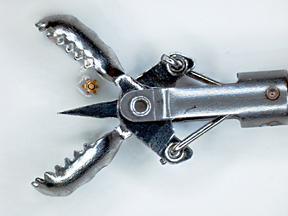 This photo compares the size of a microgripper with that the much larger forceps used in traditional biopsies. Image credit: Evin Gultepe, Gracias Lab, Johns Hopkins University. Another member of the research team, physician Florin M. Selaru of the Johns Hopkins School of Medicine, said the mu-grippers could lead to an entirely new approach to conducting biopsies, which are considered the “gold standard” test for diagnosing cancer and other diseases. The advantage of the mu-grippers, he said, is that they could collect far more samples from many more locations. He pointed out that the much larger forceps used during a typical colonoscopy may remove 30 to 40 pieces of tissue to be studied for signs of cancer. But despite a doctor’s best intentions, the small number of specimens makes it easy to miss diseased lesions. Although each mu-gripper can grab a much smaller tissue sample than larger biopsy tools, the researchers said each gripper can retrieve enough cells for effective microscopic inspection and genetic analysis. Armed with this information, they said, the patient’s physician could be better prepared to diagnose and treat the patient. This approach would be possible through the latest application of the Gracias lab’s self-assembling tiny surgical tools, which can be activated by heat or chemicals, without relying on electrical wires, tubes, batteries or tethers. The low-cost devices are fabricated through photolithography, the same process used to make computer chips. Their fingerlike projections are made of materials that would normally curl inward, but the team adds a polymer resin to give the joints rigidity and to keep the digits from closing. Prior to a biopsy, the grippers are kept on ice, so that the fingers remain in this extended position. An endoscopy tool then is used to insert hundreds of grippers into the area targeted for a biopsy. Within about five minutes, the warmth of the body causes the polymer coating to soften, and the fingers curl inward to grasp some tissue. A magnetic tool is then inserted to retrieve them. Along with Gracias and Selaru, the Johns Hopkins researchers who contributed significantly to the two journal articles were Evin Gultepe, Sumitaka Yamanaka, Eun Shin and Anthony Kalloo. Additional contributors were Kate E. Laflin, Sachin Kadam, Yoosun Shim, Alexandru V. Olaru, Berkeley Limketkai, Mouen A. Khashab and Jatinder S. Randhawa. The researchers are affiliated with the School of Medicine, the Whiting School of Engineering and the Johns Hopkins Institute for NanoBioTechnology. Funding for this research has come from the National Institutes of Health, the National Science Foundation, the Flight Attendants Medical Research Institute and the Broad Medical Research Institute. 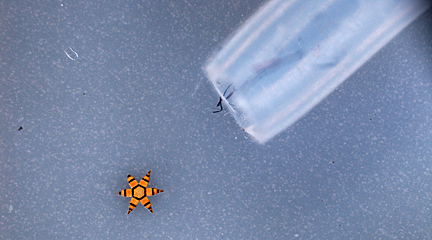 Biologic tissue sampling with untethered microgrippers, E. Gultepe, S. Yamanaka, K. E. Laflin, S. Kadam, Y.S. Shim, A. V. Olaru, B. Limketkai, M. A. Khashab, A. N. Kalloo, D. H. Gracias, F. M. Selaru, Gastroenterology 144, 4, 691-693 (2013).